WASHINGTON, D.C. -- The National Association of Broadcasters (NAB) announced today that Lieutenant General Raymond Palumbo, Director for Defense Intelligence (Warfighter Support), will keynote the Media Technologies for Military & Government Workshop at NAB Show in Las Vegas. General Palumbo�s keynote �Defense Intelligence in a Challenging Future� will take place Wednesday, April 15 at 10:30. During his keynote address, Palumbo will discuss the national security threats facing the U.S. and our international partners, particularly in the areas of urbanization and population growth. In his current position as Director for Defense Intelligence (Warfighter Support), Palumbo reports to the Under Secretary of Defense for Intelligence and ensures the Combatant Commands have the intelligence capabilities to perform their mission. He also leads the Intelligence, Surveillance, and Reconnaissance (ISR) Operations Directorate. General Palumbo was commissioned as a Second Lieutenant in the infantry upon his graduation from West Point in 1981. He served as the Executive Officer for the 3rd Batallion, 160th SOAR(A) at Hunter Army Airfield and as an Air Operations Officer, J-3 Directorate, Joint Special Operations Command at Fort Bragg. He then commanded the 5th Battalion, 158th Aviation Regiment in Giebelstadt, Germany and served as the chief of staff and later program manager of the National Assessment Group. After commanding the 12th Aviation Brigade in Germany and Iraq, General Palumbo returned to the United States and served as the Executive Officer to the Commander of the United States Special Operations Command at MacDill Air Force Base in Florida, before taking over as director of strategy, Plans and Policy (J-5) at the United States Special Operations Command. 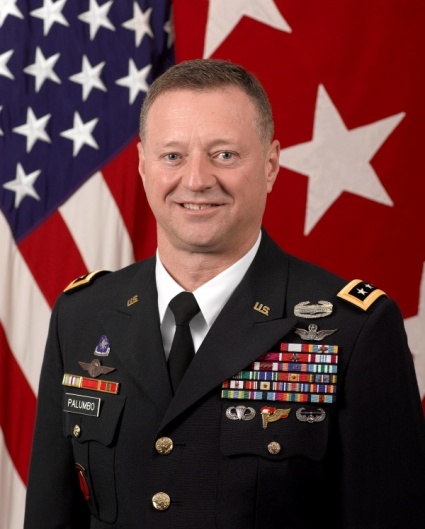 After returning to Fort Bragg, General Palumbo served as the Assistant Commanding General of the Joint Special Operations Command, and as Deputy Commanding General of the United States Army Special Operations Command. He most recently served as the Commanding General, United States Army Alaska, where he simultaneously served as the Deputy Commander, Alaskan Command. Geared toward military and government acquisitions and production personnel, satellite and broadband providers, commercial manufacturers and R&D technologists, the Media Technologies for Military & Government Workshop focuses on the challenges faced by government and industry, solutions for those challenges and future opportunities. Topics include digital asset management, COTS applications, cloud computing, encryption, field operations/mobile, mission critical video streaming, and broadcast-quality production.